Should fake antique dealers be punished? A fake ancient coin dealer was sentenced to three years in jail and fined at a Nanjing court days earlier, causing an uproar in the collections society of whether the cultural relics market should observe the modern business norm of credit. A customer shops at an antiques booth in this undated file photo. According to a report in the Market News, the Nanjing citizen surnamed Qin, sold 110 counterfeit ancient coins at 400 yuan each, claiming they were unearthed from a construction site. Qin pleaded not guilty of deceit, as there's an unspoken rule in trading antiques that it is the buyer's responsibility to determine the authenticity of the pieces. An industry insider says it isn't deception to sell fake articles or deny returned goods on the collection market. People in this domain rely on their knowledge and experience to sort out masterpieces, and enjoy evaluating and differentiating antique articles, a shopkeeper at Nanjing Ancient Relics Market said. 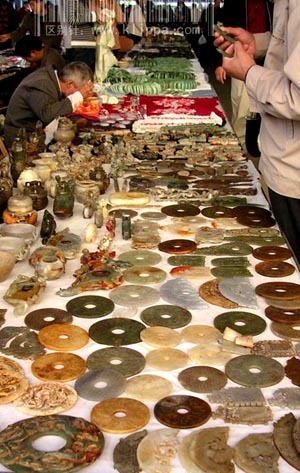 Experts estimate as many as half of antiques dealers would face jail terms in China if the country punishes them using current laws for common businesses, and more astonishingly, Professor Yang Jingrong, a pottery expert at the Forbidden City, said during an interview with the Beijing Morning News that 95 percent of all articles on the antiques market were fakes. In Jingdezhen, China's porcelain capital, despite high salaries paid for professional craftsmen who are hired to make artificial artworks look vintage, a well-made replica of a porcelain vessel could earn the producer at least 200,000 yuan, Yang said. In the 90s, the first highly-detailed fake blue-and-white Yuan Dynasty porcelain vase was sold for three million yuan at a foreign auction. Fake antique articles have left many collectors suffering from hefty losses, as the technological trend of counterfeiting becomes a headache for even the most experienced experts -- irradiating chemical elements of vessels, advanced ways of printing, and even fuming with boiling tea to make scroll papers pale and crisp. Some raise bugs and mice to bite on scrolls to make them appear ancient. Rampant forgeries have discouraged art collectors and struck a blow to the antiques business, and disrupted auctions. A famous painter who asked to remain anonymous said he once saw a fake painting auctioned off for 1,500 yuan that was exhibited two days later at another auction starting at a base price of 25,000 yuan. An insider said some small auction houses specialized in selling fake scrolls of calligraphy and drawings to amateur collectors in the industry that could simply be manipulated due to a lack of public surveillance. As for the Nanjing case, the judge said selling fake antiques is not always punishable, considering the seller might also be ignorant of their authenticity or the buyer may be willing to purchase them even if he is uncertain about the article's authenticity. He suggested more effective regulations be worked out so that the court does not bend to industry norms.